Central City Development Group has been getting outstanding Press for their recent developments. For the first time in the History of Los Angeles, a business is able to place their sign atop a residential high rise thanks to the expertise of Hamid Behdad and CCDG. 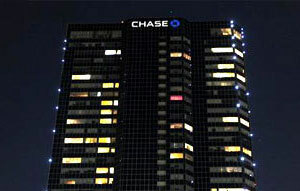 After a bit of controversy, Chase Bank has added its name to the downtown Los Angeles skyline. The bank reached a deal to pay condo owners at 1100 Wilshire Blvd. $17,500 per month for the right to put its name on their 37-story building on the western edge of the downtown skyline. One of the homeowners was so upset about the deal that he sought to block it in court, but a Los Angeles County Superior Court judge refused to intervene. The new sign was installed earlier this month. The building’s homeowners’ association intends to use the money for upkeep and maintenance, including a planned upgrade of its aging elevator system, said Mark Tarczynski, a member of the association’s board of directors. Without Chase’s money, homeowners could have faced a special assessment of $10,000 each to fix the elevators, Tarczynski said. City building officials allowed Chase to install the sign because the bank is opening a branch in the lobby, meeting requirements that signage be tied to a business inside the building. The bank’s sign will be visible to tens of thousands of motorists who drive north into downtown every day. It gives Chase a presence in a downtown skyline that includes signs of competitors US Bank, Bank of America, Union Bank and Wells Fargo Bank and a chance to improve its brand recognition just five years after entering the California market through its purchase of Washington Mutual Bank. Homeowners voted 69 to 29 to add Chase’s name to the building, Tarczynski said. “It’s a phenomenal windfall for everybody,” he said.